More than five years after retiring to reflect on my dream jobs – sparring with Brian Clough throughout his years at Nottingham Forest and helping the likes of Mo Farah and Jessica Ennis get their early national publicity – I had the proudest, most humbling moment of my life on Sunday 2 November 2014. 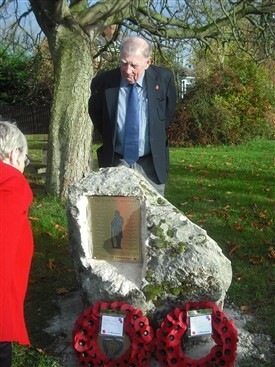 I presented to the Nottinghamshire villages in which I was reared, educated, played and now live Great War memorial plaques to all 29 men whose lives had touched the community before they perished. Only 15 names were on existing memorials. I found the rest almost by accident. The unlikely tale began in November 2012 when Local History Librarian Tim Warner asked me to write “a few paragraphs about how The Great War affected Newark”. All he wanted, he explained, was an intro for a massive file that had been compiled over the previous decade about soldiers, sailors, airmen and ‘others’ from the town who had perished in action 1914-18. Trawling through weekly newspapers from late 1914, I soon found a letter from a soldier to assure his wife “I’m still in the land of the living – but God knows how.” He explained that a German shell had blown him onto a roof. When he rolled off, he found himself impaled on his own bayonet. But, he added, the doctors assured him he’d be fit enough to return to the battlefront six weeks’ hence. Back home that night, I used the miracle of the internet to trace what happened to that bloke and discovered he lived into his 70s. I was hooked. My research over the next 18 months accumulated half-a-million words about how folk fought, worked, lived and died from 1914-18 and beyond. Some 95,000 of those words went into the book Newark in The Great War which was published by Pen & Sword and launched in August. I can’t say I wrote it: I merely reported what people said and did at the time. The rest of the words were about the rural communities around the town and as I was born in Bathley, educated at South Muskham Church of England Primary School, played many childhood weekends at Little Carlton and have had a home for over 50 years in North Muskham, my attention was quickly drawn to the experiences of these villages, all within a mile or each other just north of Newark. Imagine my astonishment when I realised my research had unearthed almost twice as many victims than are on traditional memorials – and that did not count a Sunday School teacher whose wife received a telegram regretting he had been killed in action and, a week later, got a postcard from the man himself saying it had been a case of mistaken identity. There are many reasons … Come 1919, everyone had had enough, struggling to stay alive on the battlefronts and fed on the home front. No civilian body had kept records of deaths in action. Few military records included home addresses. Memories were as tired as bodies. Young men whose fathers had moved on in search of farm work were simply forgotten. Others who had not been born in the parishes were considered to be ‘not ours’. There was no internet then – a blessing now to a bloke like me who knew my technology was stuffed for most of my career if my pencil broke or my pen ran dry. So old newspapers and census returns, modern genealogical websites and the Commonwealth War Graves Commission’s wonderful records enabled me to, in effect, re-write history in a £3 booklet called The Muskhams, Little Carlton and Bathley in The Great War. I published it through the Bathley History Society, persuaded the Parish Councils of the villages to support it by purchasing copies – and made enough profit to finance memorials. My ever-supportive wife Gillian came up with a design which, by general consent, is unostentatious yet dignified, matching the village men who marched off to The Great War. BHS Treasurer Jim Hawkins liaised with County Signs on the Newark Industrial Estate, who produced the Memorials on resilient material that is imported from the USA but value-less to scrap thieves. 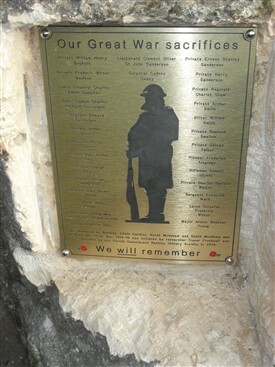 The Reverend David Bartlett blessed the plaques at a Great War commemoration service in North Muskham Church. In short, it became a combined community effort echoing, very slightly, the selflessness of a century ago that we should never forget. All we need to do now is raise £400 more to provide Memorials for the two churches, chapel and school in the community! This page was added by Website Administrator on 11/11/2014.